There is no task more solemn than the one passed down to us by our founding fathers, who summon us from the past to execute their humble vision for this republic. We honor their memory, we accept this responsibility, we cherish this task. 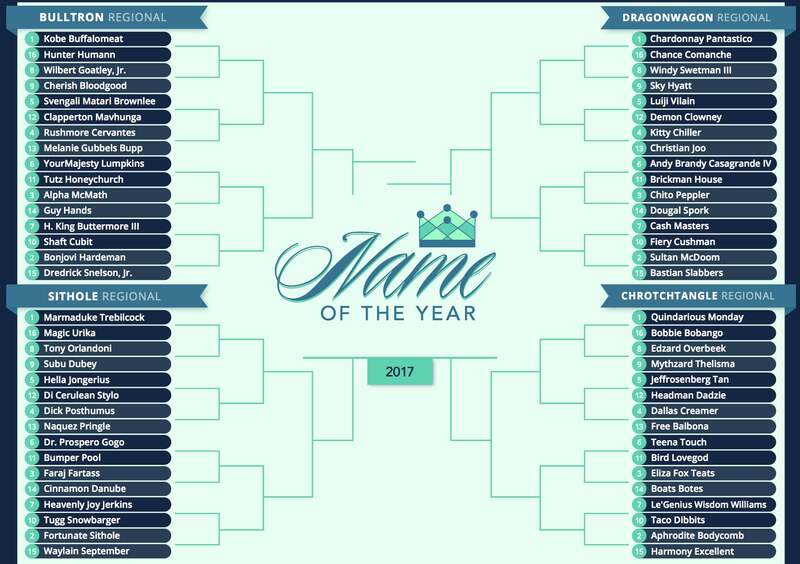 We vote for the Name of the Year. And though we are bound by duty to accept the will of the People, we also fear the tyranny of the mob. We have seen it rear its ugly head before. In 2008, a feelgood network of sycophants and toadies fashioned a cult of personality around Spaceman Africa. We have also witnessed the wisdom of the crowd, the uplifting rally in 2009 behind that movable feast of onomastic joy, Barkevious Mingo, whose kingdom shall have no end. Now come this year's candidates with their personal David Axelrods and their entourages of adoring fans. 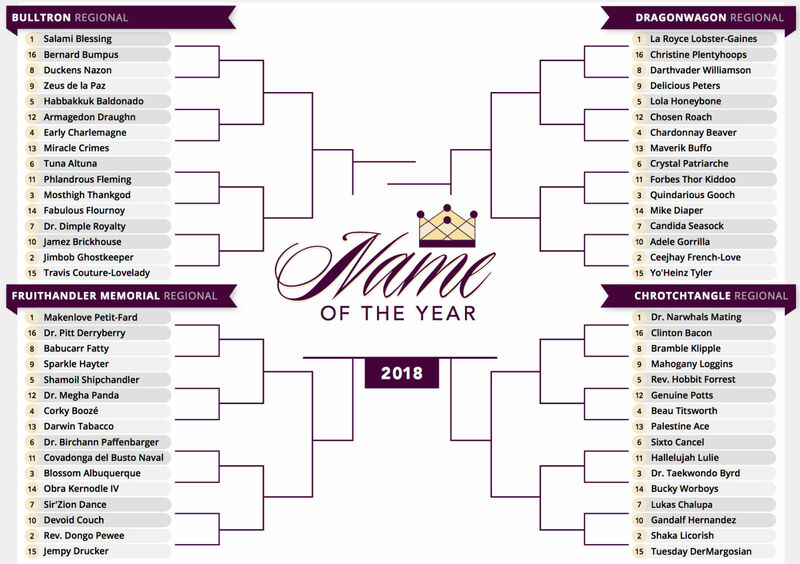 Yes, Chrotchtangle Regional No. 15 seed Pat Angerer, of course, husked enough votes in the great, flat state of Iowa to score a slim 51-49 majority over No. 3 Pencilman Jeffries. And in the Dragonwagon, No. 4 Steele Sidebottom had an entire nation -- Australia -- get out the vote in his similarly close victory over beloved No. 1 Spontaneous Gordon. We mourn the vanquished -- not only our respected friends Spontaneous and Pencilman but Just-in'love Smith and Furious Bradley and their fallen brethren. 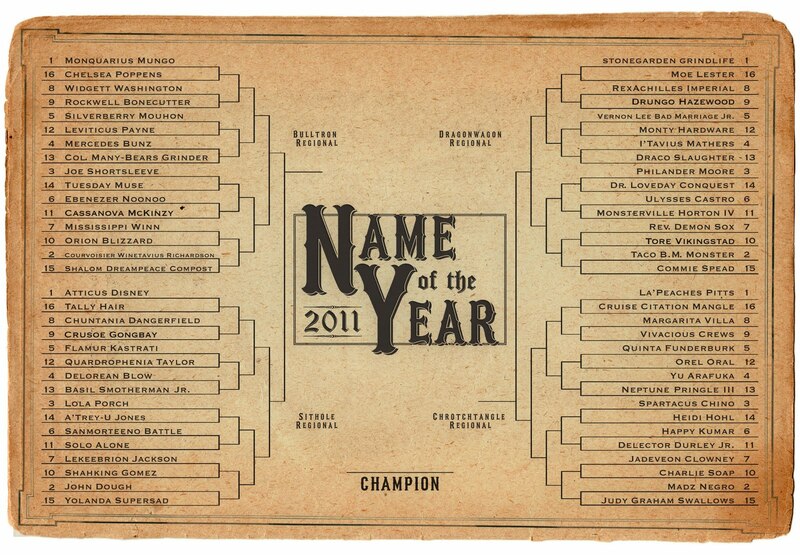 The right side of the bracket is, we declare, the weak side of the bracket. 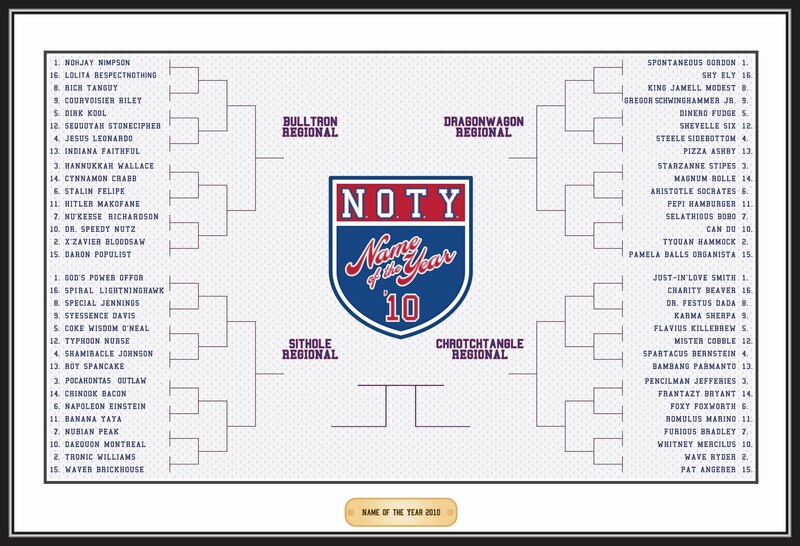 Yet we implore the public -- from Ames to Adelaide, from Sioux City to Sydney -- to set aside petty partisanship and choose those names that embody the true spirit of NOTY, the names that will bring pride to this planet and honor to the solemn task for which you, the People, have been chosen. Vote well. Vote honestly. Vote twice. No. 4 Steele Sidebottom: Collingwood Magpie. No. 3 Starzanne Stipes: Zanesville, Ohio, soccer player. No. 15 Pat Angerer: Former Iowa linebacker. Video tribute!